The Upper Bridge River Valley is a friendly “community of communities” with a small town feel and a distinct identity anchored in its mountain surroundings and its mining past. It is the home to long-time residents with mining roots, young families new to the area, and both new and established part-time residents. Nestled on the eastern edge of the Coast Mountains, its landscape is characterized by broad valleys and ridges, numerous lakes and rivers, sub alpine and alpine meadows and mountain peaks, making it the perfect place for wilderness recreation. Outdoor enthusiasts flock to the area year-round to enjoy a wide range of activities. Summer adventures include mountain biking, hiking, camping, horseback riding, boating, fishing and hunting. In the winter, the area offers unparalleled opportunities for snowmobiling, ski and snowboarding touring, heli-skiing and boarding, snowshoeing and ice fishing. 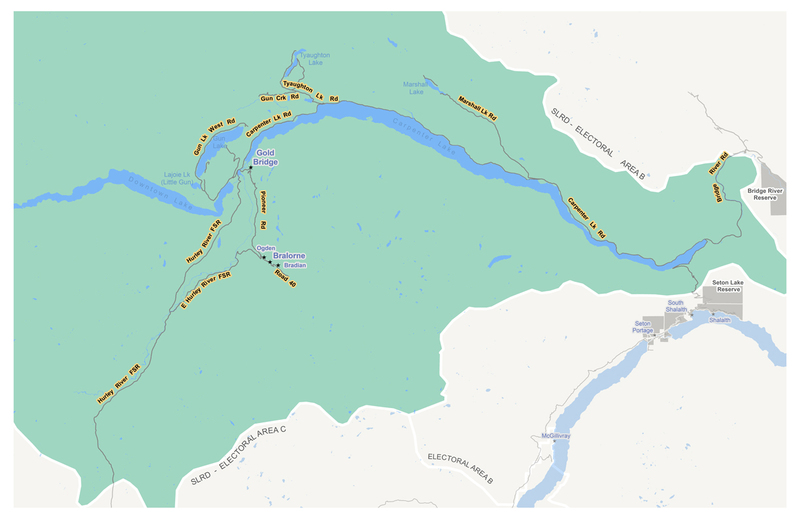 The Upper Bridge River Valley is found within the traditional territory of the St’at’imc Nation; several St'at'imc communities frequently use the Upper Bridge River Valley, which has supported the hunting, gathering and cultural traditions of these communities for thousands of years. In the 1850s settlers arrived in the region in search of gold. The trend continued until the 1930s when the Bralorne Mine was the largest gold-producing mine in Canada. It is estimated that in the 1930s and 40s there were as many as 5,000 people living in the area. The economy is supported mainly by tourism, mining, forestry, and some agriculture. The area is also the site of the Bridge River Hydroelectric system; the third largest of BC Hydro’s generating facilities. Electoral Area A is the northwestern-most area in the Squamish-Lillooet Regional District. It is bounded by Cariboo Regional District to the north and west, Electoral Area B to the east, and Electoral Area C to the south. For more information about Electoral Area A, download the Community Asset Inventory or contact the Bridge River Valley Community Association. There are currently no upcoming events posted. Feb 7, 2019 - SLRD Short-Term Rentals Public Survey Check out the Current Project Page for further information!